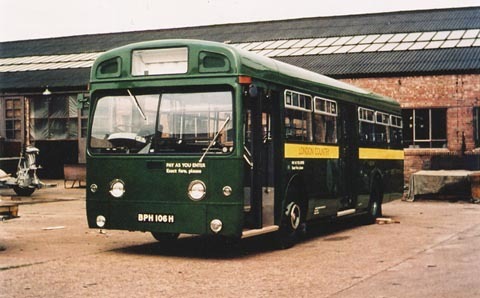 BPH 106H is one of the first batch of 148 Swift 505 vehicles ordered by London Transport at the end of 1968. These were built on the 10m length AEC chassis type 4MP2R after experience with the longer Merlins had shown some operational difficulties. From this total, 48 were of type 1SM3/1 specified for extending one-man operation within the country area. By the time they were delivered from May 1970, the country area had been separated from the red, central area. Accordingly, they carried Surrey registration marks in the series BPH 101H to BPH 148H. The buses were numbered consecutively with the central fleet, and became SM101-SM148. SM106 has chassis number 4MP2R435 and carries body number B57109. The first 50 vehicles of this first batch of 148 had fully-seated, single-door bodies by Marshall, the remainder were given dual-door bodies by Park Royal Vehicles. The first 50 PRV bodies were classified 1SM1 and given the numbers SMS51-100. These 'standee' buses were fitted for split-entrance, Autofare operation and had 25 seats situated up one step behind the exit doors. Eight seats were fitted originally in the front part of the bus, all in bench and single seats on the offside. A partition channelled Autofare customers through the turnstile into the nearside standing area. The remaining, country area vehicles SM101-148 were similar, but because decimalisation loomed, and country area Autofare machines had not been a success, the AFC machinery was omitted and replaced with an elevated luggage pen over the nearside front wheel-arch. The luggage pen arrangement was unique to these vehicles, as the subsequent MCW-bodies for the country area had a nearside bench seat and a luggage pen by the exit doors. There was also an overhead luggage rack on the offside, a design copied and executed exactly as found on the fully-seated country MB class Merlins. Another resonance with these vehicles was the curious chamfered appearance of the luggage pen, which was almost identical to the offside AFC machine mounting of the country MBS when new. Two single seats were fitted at the forward end of the lower saloon, to improve the space for circulation, and conventional bench and double seating filled the the remainder to give a total seating capacity of 38. It was intended for up to 22 standing passengers to be carried, but this was reduced to 18 before entry into service. The specification of all the chassis was unique to London Transport, in so far as the braking system differed from the standard. 'S' cams and automatic slack-adjusters were fitted to the brake operating shafts and air-assistance was not provided for the handbrake. The air-operated, self-changing gearbox was not set for automatic operation, this difference was in common with country Routemasters when compared with their red counterparts. Door operation was by air pressure rather than electrical as found on the previous Merlin vehicles. There is some argument over whether public-address equipment was omitted along with the Autofare machinery. The external speakers were definitely fitted, as photos show very clearly. Well, they show that panels for speakers were fitted in blanked ventilator slides, but exploration of SM106 suggests that the internal speakers and the wiring wiring have also been removed at some stage. Whether they were ever fitted is another matter! << BACK....to the BPH index >> NEXT....WHY ?